The following is a transcript of the third installment of our “Making the Most of Your Event Content” series that was held on June 29, 2017. When promoting your calendar, don’t stop at letting your audience know you have an events calendar, and that it’s chock full of user-centric features. Kick it up a level and highlight how your calendar benefits your audience! It’s important to keep your contributors and users in mind when building messaging. Save Time: Adding an event takes less than two minutes and once approved, it’s on the calendar. If the event Place changes, for example, the original creator can always access and edit the form directly from the event page. If a Group, Department, or Place wants to add a ton of events, share your Bulk Event CSV template with them so that they can submit all of their events at once. Evergreen Data: Once an event is on your calendar it’s there in good times and bad because Localist never purges calendar content. This means that even after an event is over it will still be discoverable, which is extremely helpful for users to see a track record of the great events already hosted or may be hosting again in the future. Let’s say a user goes to your calendar for information on the annual 5k run on the 4th of July. If you aren’t hosting it this year, the user can still see the event details from last year as well as find other 4th of July plans while they are on your calendar. A past event will never rank higher than a current event in a search engine results page, so there is no need to fret. Promotion Eligibility: A benefit to being a contributor is that their events are eligible for Promotion. So, if their event matches criteria you set in your event Newsletters or Widgets, then they will automatically be included in these listings. Contributor events can be publicized to a more targeted group without any extra work on their end. Who doesn’t like free publicity that takes no time? See the Santa Clarita Arts Widget below? 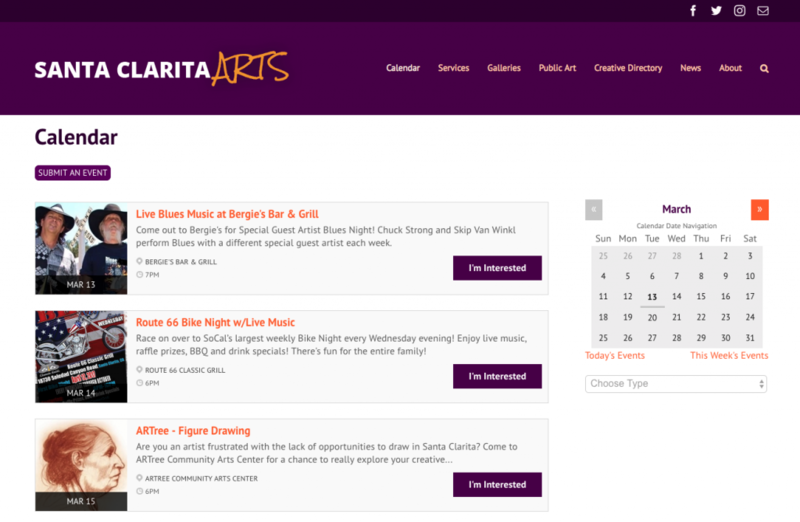 Any contributor who added an Arts Events to Visit Santa Clarita’s calendar would also have their event on the widget on Santa Clarita Art’s website. Audience Demographics for Contributors: You can share the data about who is using your calendar with local stakeholders to get them to put events on your calendar. So you can tell community members how often events were created and who is your primary audience. Like when you are placing an ad, you want to know who will see it and the traffic it receives. Speak about your calendar as a free way to share their event content with their target audience. Someone hosting a kids camp might not be enticed to post that on your university’s calendar. Audience Demographics for Users: Who is visiting your site is also of interest to your users since they know that the events are as distinct as the different hosts for each event. Events will always be presented in the voice of the community/host and feels like the people it serves. Since you allow the community to contribute, the calendar is constantly updating and will always have a wide range of dynamic content. Visual Learning: At the end of the day, most of us are visual learners. Enter in a few events to show users live examples of what their events could look like. When they see their events live in living color it can help users visualize how Localist could work for them. These give organizations and/or places their own corner of your event calendar where they can add photos, a description, list upcoming & past events, and social media links so it has all the context the user’s need in one place. Save Time: Once a landing page is created, the submitter will just need to select the landing page instead of repeatedly entering address details. Click Backs: The event landing pages or place landing pages are filled areas to include backlinks. Whether links are added to descriptions, custom fields, or website buttons, users won’t be cut off from continuing their online hunt. Bring It to Life: At the end of the day, most of us are visual learners. Bring all of these points to life by presenting a live example of their content or landing page. For event organizers: they can see the amount of interest on an upcoming event for planning purposes and to influence future events based on what users enjoyed. For users: it’s helpful to see what events their friends are going to on campus or around the community. Your community is social, so they want to see what others are doing. When they click “I’m Interested”, a big plus is that they get a reminder the day before and are prompted to leave feedback after the event. This way they won’t miss an event because they forgot to add it to their calendar. The more people express interest in an event, the larger the positive impact in Trending. Trending removes the guesswork in figuring out which events are popular, interesting, and are worth attending. Contributors can see what’s popular among users and get the chance to have their event at the top of the calendar’s homepage if users want to attend. As a reminder, how events appear in Trending is determined by an algorithm that includes user interest and engagement with the event. Localist is easily navigable allowing users to browse by Group, Department, Place, and Filters. Make sure to let your users know how simple it will be for them to find what they are looking for and they won’t waste their time on a messy calendar. Users don’t want to have to work to use your product, and they don’t have to. They can easily see only concerts, family-friendly events, or events hosted in another language depending on how your platform is set up. They don’t have to skim through to find what they want, they can look in a targeted place. It is really important that you don’t just announce your calendar, but keep mentioning and plugging it consistently. If you are a higher ed institution, you get new students every year. In tourism, you always have new visitors in your area. For a library, people move to the area every year. Hospitals are always seeing new patients. Your users are always changing and growing so make sure you do not have a “one and done” attitude about your messaging around your calendar. What better way to promote your social calendar than on social media? You’ve already built up an online following so let them know that your online presence has expanded. I know you are already promoting events on social media, so drop a line at the end about seeing more events on the calendar. Post a few things dedicated to highlighting your calendar as a whole with a CTA to click. 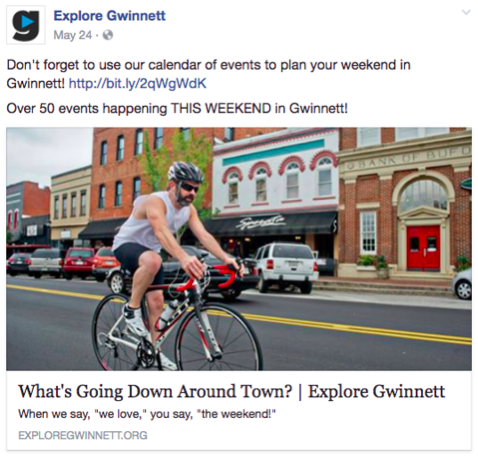 For Explore Gwinnett, the tourism bureau for Gwinnett outside Atlanta, they share a link to their calendar to remind their followers to see what’s going on. 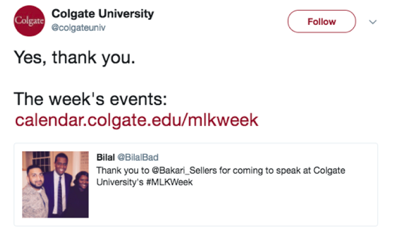 Colgate had a student than a presenter as part of their MLK week series, and Colgate included a link to their channel of MLK week events in their response. 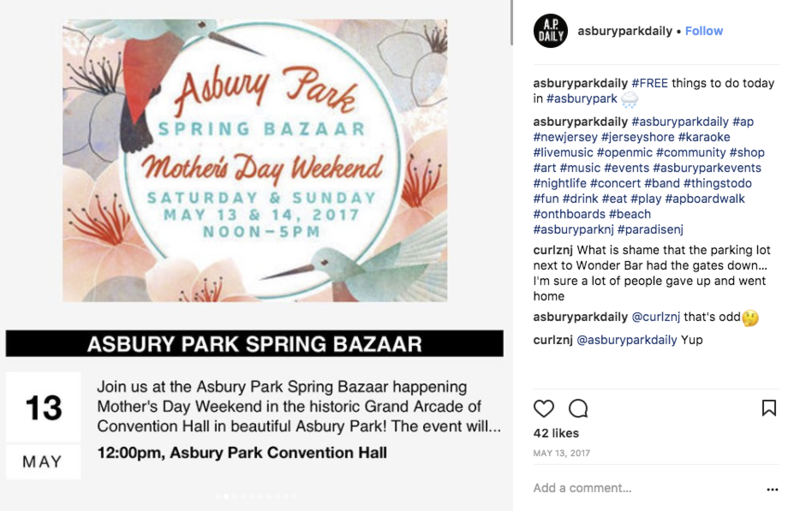 Asbury park built a widget that they can screen shot to include in Instagram posts about what is happening in Asbury Park that day. If you’re preparing to or have just launched Localist, a blog post is the perfect place to share your excitement and the benefits your new platform has to offer. Continually highlight the calendar. With each new article about a speaker series, have a line about viewing more events on the full calendar. If there is a local park with construction being done, have a link to the calendar with a prompt to view the modified schedule during renovation. If you were just ranked in the top 50 beaches to visit in the US, in your post about link to events happening on your calendar for visitors and locals. 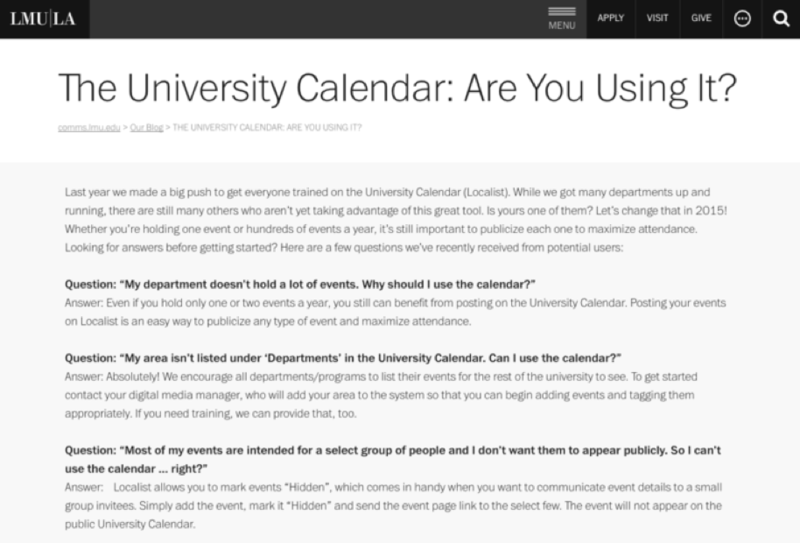 Loyola Marymount University decided to re-engage students about their calendar a year after launch to keep people engaged and answer common questions students had for them about their calendar. Another great way to engage user is to include a CTA in your regular newsletter communications or events section. At minimum, your new calendar should be announced in a special email blast and make sure you’re sending a regular dedicated events newsletter or including a sampling of events as a part of other communications. For example, tell each new community member about your calendar as part of your new user experience. So that thing you are already sending can work for your calendar, too. Think of your Localist platform as another social media platform. Just like your Facebook & Twitter accounts are given a shout out in communications or their icons are splashed across headers and footers, treat your calendar the same. Your calendar may be online, but that doesn’t mean that’s the only promotion route you can take. While you are all tech savvy and might not remember the last time you used something like a paper phonebook, you shouldn’t discount written materials. If you are already creating brochures, information packets, or utilize signage, include a call to action to visit your events calendar. It helps to include another place for users to learn about the calendar, especially if it is next to other important info. Welcome packets, travel brochures, playbill, etc that will always have a physical version is another touchpoint with potential users. Now that you are encouraging people to come to your calendar, lets cover how you can promote your events directly within Localist. Have a festival or a series of themed events that you want to make sure people know about? Use a Channel to Promote events based on a variety of criteria. A Channel can be totally customized to reflect the series or festival you are highlighting, the only branding that has to stay the same is the header and the footer. The rest is negotiable. 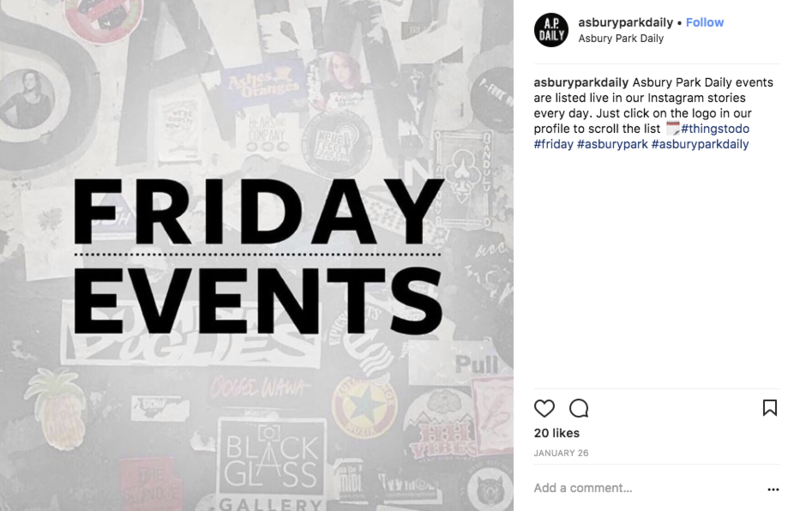 The Featured Carousel is a great way to promote really cool events you want to make sure your users see. It can hold up to 10 events at a time, appearing in chronological order. Once the most recent one ends, a new one appears in the carousel. You can flag an infinite number of events as Featured and they will enter when it is their time. If you have events that need a little help, but you do not want them featured in the Featured Carousel, you can Sponsor them which gives them a boost in trending and different styling. This is a great way to make sure that events appear higher in trending and stick out on the page to your users. If there is a huge event you want promoted above and beyond the normal ways, like the someone special is visiting campus, or someone is paying for a prime shot, you can add a special block with the theme editor and have that event displayed there as you can see on the right. These are a great way to spread Localist content naturally on other sites. They automatically display event descriptions, locations, dates, times, and an event photo. This can be anything from your website homepage to a local chamber of commerce site to a department homepage. You name it! By using a Localist Widget on external sites it allows users to discover events passively in their own time and on their own path if they are not actively looking for events. Your users are expecting everything they need to be accessible from the same page. Widgets allow you to put your event content where your users can organically find it while linking back to the calendar. You are looking at homepage widgets that customers have chosen to put on their organization homepages. Using a Localist widget saves you time since you do not have to re-enter the data and the widget automatically populates so you can set it and forget it. No need for continued Promotion. By using a Localist widget, you get the click throughs to your calendar that you wouldn’t get If you were to enter separately or use the API. Make sure there is a CTA at the bottom linking to the rest of your calendar or events of the same type. So a button that says “view more events” or “view more concerts” to direct users back to your calendar for more. Localist widgets are highly customizable so you can have them match your Localist’s platform’s branding or the branding of the site they are being put on. Speaking of branding, by using the same event content in a widget, you can ensure that you have a consistent voice associated with your events.